We planned our trip — with Cedar Point as the highlight — and built a family getaway around it. Our first stop was a bit west of the area, at Put-in-Bay. Then we headed over to Sandusky for a couple days. I have to admit, I had no idea there were so many fun things for teens to do in Sandusky, Ohio! We capped off the trip with a full day at Cedar Point, even riding the brand new, record setting, Steel Vengeance! 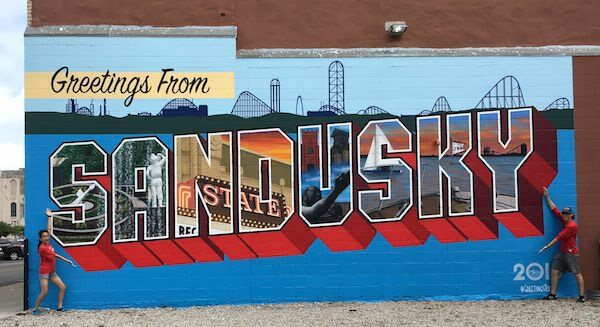 In between, we explored the charming town of Sandusky — and made some incredible memories in the process! 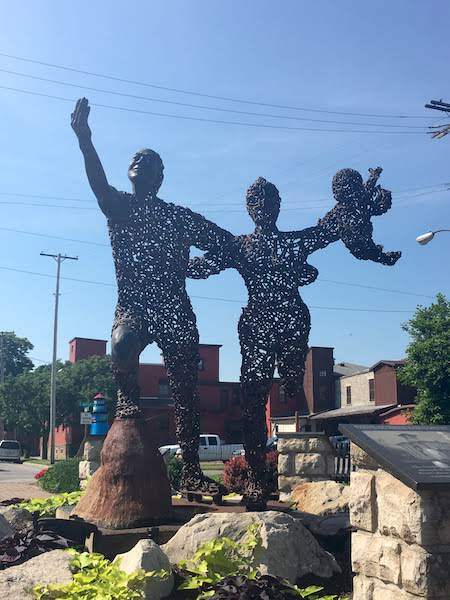 Downtown Sandusky is easy to explore on foot. There’s ample free parking, both on street and in the lots near Sandusky State Theater. If you want to step it up, take a Sandusky Segwave tour of the city — note the age and weight requirements to take a segway tour. Since one of my kids wasn’t big enough to “drive” a Segway, we opted to explore on foot — and we found some great gems! The waterfront area in Sandusky has lots of parks. At the eastern end of downtown, Shoreline Park has walking trails, a sandwich shop, playgrounds, ponds, fountains, a kayak launch and benches where you can enjoy the view. As you walk west along Shoreline Drive, you’ll see the marina and pier on the right — where the Goodtime lake cruise boats dock. We didn’t take a cruise this trip, but both my husband and I have fond memories of them from our childhood. The pier is home to a couple of food trucks, too. So, grab a bite and watch the boats come and go from one of the benches at the end of the pier. The breezes here are pretty stellar, too. On the left side of the street, take some time to read the plaques that surround the statue at Facer Park. Sandusky played a major role in the Underground Railroad, and that story is told here. There’s also a small gazebo where you can sit and enjoy the view. 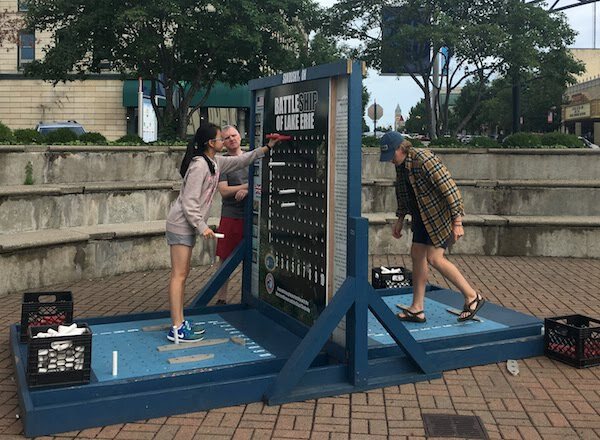 A couple blocks west, you’ll get to Mylander Park — where you can play a giant game of Battleship! I’m not sure why super-sized board games are so fun, but they are. Our kids spent an hour playing the game (despite having the regular sized board game at home and unplayed for years). But, it’s not just kids who are drawn to this giant game. 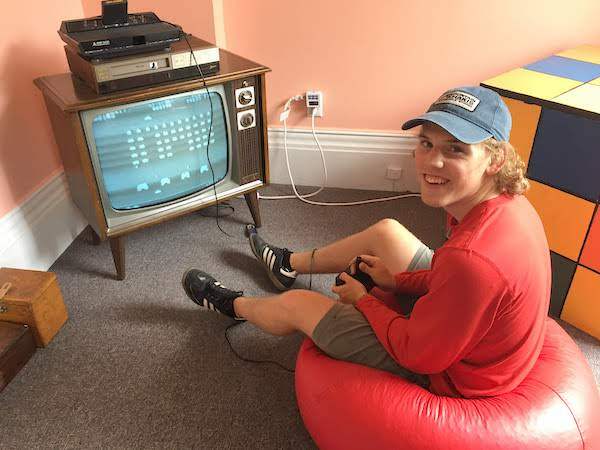 We watched people “our age” play the game later in the day — laughing as hard as we did. 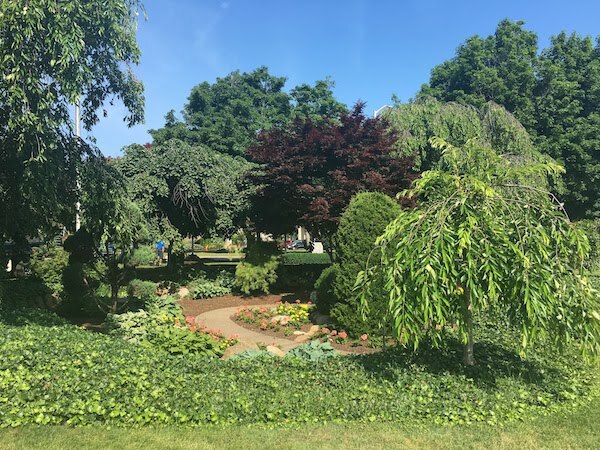 Other parks in Sandusky add to the beauty and charm of the city! Washington Park is not on the waterfront, but it runs right through the middle of town, with fountains, the famous clock, gardens and walking paths. It’s a gorgeous park to have a picnic — or simply to walk through as you go from place to place. True confession! This stop was for me. 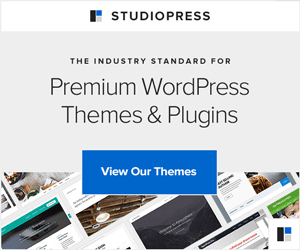 I have always loved the carousel, but my family? Not so much. They were good sports and went along anyway. And, they loved it! Allow two hours to visit the Merry-Go-Round Museum, located at the corner of Jackson and W. Washington Streets, across the street from Washington Park. Click here to read my full review and learn more about the museum. Anyway, after reading several menus, we decided to grab a slice at Mona Pizza Gourmet. Huge fans of New York style pizza, we were thrilled to find this place! The pizza is about as New York as it gets outside of the Big Apple! By the whole pie or a slice. It’s a great, inexpensive lunch for a family on the go. After lunch, we got our car and drove a couple miles to the historic Hubbard House at 134 E. Adams Street to try our hand at one of the best escape room experiences in the country! We were hosted by “Escape Rooms by FrankNicky,” which invites guests to try their hand at escaping the 1980s. It’s an amazing room jam packed with all things 80s, including a GREAT soundtrack! While we didn’t figure it out in time, we still had fun! We knew what we were looking for and we had all the pieces, but we couldn’t figure out how the last couple fit together (so to speak). Except for not getting out in time, we loved the room and how they use 1980s music throughout the whole thing. Another option here, which is something new to us, is the “Unlock Sandusky” experience, which we also got to try. We managed to figure this one out in the 60 minute time limit! 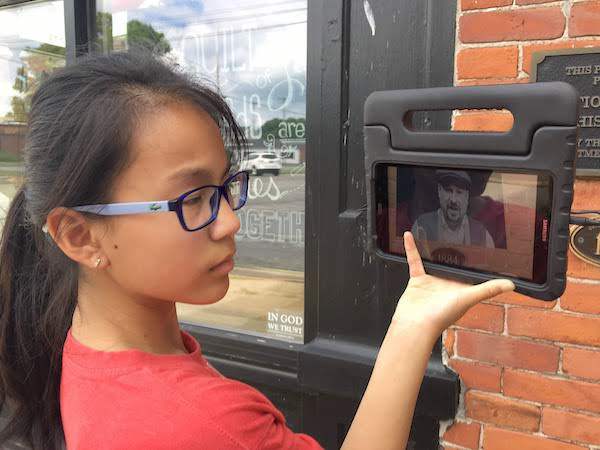 “Unlock Sandusky” sends guests into the city with a puzzle book and a tablet to learn the history of Sandusky while uncovering a mystery. Solve it (we did) and win a prize. This was a great alternative to the traditional escape room and even proved to be a bit educational! Remember when I mentioned those patriotic street names? Well, it turns out Sandusky is a planned city and the street layout and names have a specific purpose — which you’ll learn on this experience. I mean that literally! One of the newest stores in Sandusky is Paddle & Climb, at 305 E. Sandusky Street opposite Facer Park. This outdoor store sells clothes and equipment for outdoor sport lovers. Or, for those like me, who like the comfort of these clothing lines. 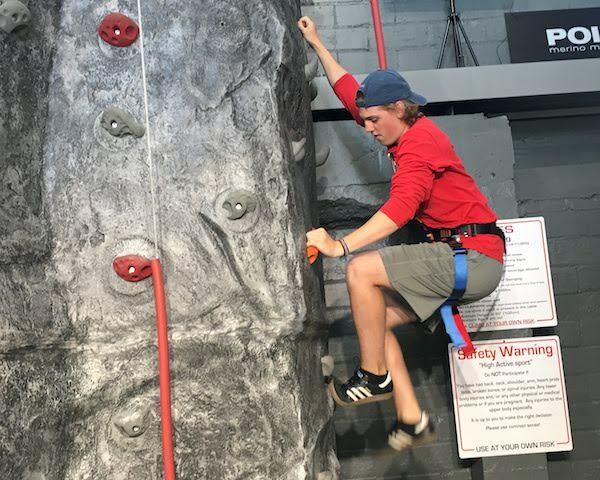 They also have an indoor climbing wall with a several different “routes” to the top and offer kayak and paddleboard rentals. They’re located just a block from the kayak launch at Shoreline Park making it easy to rent a boat and hit the water. Our son works at a rock climbing gym at his college, so we headed to Paddle & Climb to climb with him. I’m a big chicken when it comes to heights, but I’m a competitive mom. I’d climbed once before, so I knew I could do it! I couldn’t figure out the hand grips at one point, but Ben coached me through it and I made it to the top! A single climb is only $5 and an unlimited day pass is $15. Equipment is included. Wear close toed shoes for this experience. We started with the queso blanco, which was served with house made corn chips. Then, Ellie and I got rice bowls while the guys got a variety of tacos. I like the rice bowls because you can choose exactly what you want. But, the best bite award went to the carnitas taco. 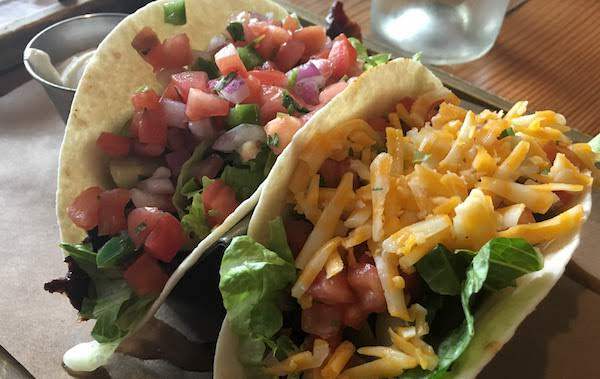 The restaurant is known for its BLP (Bacon, Lettuce and Pico de Gallo) taco, but that was their least favorite of all the tacos. It was good, but they both felt it needed more bacon to stand up to the other flavors. Still, this was probably the best meal of our whole trip, so we aren’t complaining! After dinner, we walked around downtown some more, window shopping and taking goofy photos, before heading to the hotel for the night. We expected our day in Sandusky to be mellow, kind of a down day before heading to Cedar Point. It turned out to be loads of fun, a highlight of our summer, and a perfect place to find fun things for teens to do! To plan your Sandusky getaway, visit Ohio’s Lake Erie Shores & Islands (the CVB for the whole area). 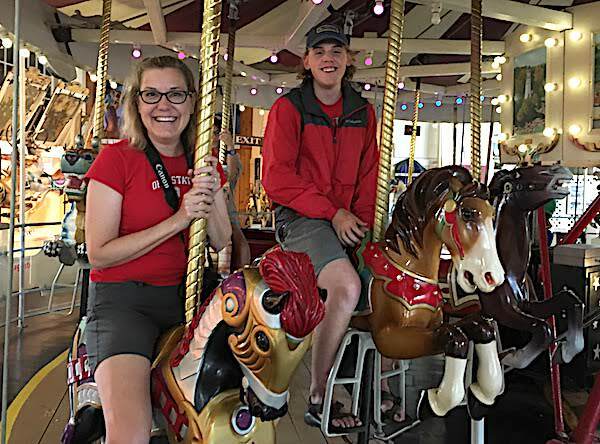 We’d like to thank the Merry-Go-Round Museum, Escape Rooms by FrankNicky and Paddle & Climb for hosting our visit. All opinions are our own.